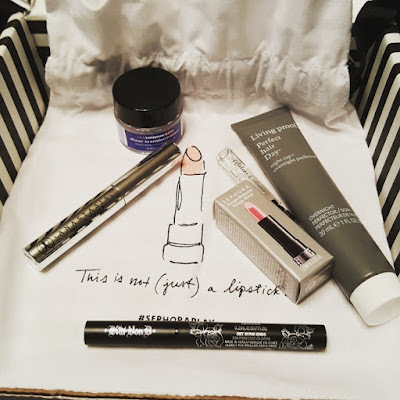 I’ve been subscribed to Sephora Play a few months. I’ve been enjoying the samples I’ve been receiving. It’s really fun to try new things each month. This month’s theme was the unbasic basics. There were some samples I really loved and some I felt so-so about. Sephora Lipstick in Love Spell- I don’t think this color is for me it’s a little too sheer for my tastes. If you like a sheerer barely there color I think you would enjoy it. But, I do like the formula it’s very moisturizing it looks like there are some nice colors in the range. Ole Henrickson Sheer Transformation- I loved that this was so light weight. I’m very bad at moisturizing in the morning because my moisturizer feels kinda heavy. According to the playbook this can double as a primer which is nice. So, I like the double duty aspect. However, I didn’t see a difference in my skin. Kat Von D Tattoo Liner in Trooper- This was one of the products I was most excited to try I’ve heard a lot about it and it really lived up to my expectations. This eyeliner didn’t bleed and it stayed all day. I think it is pretty black. I did learn I’m not good at a free hand cat eye that Youtube makes it seem so easy. Anastasia Beverly Hills Clear Brow Gel- I was also excited to try this one. I’ve just started filling my brows. I like how easy this is to apply. Alone it creates a really subtle look. I have kinda light brows so I really enjoyed using a powder, I just used eyeshadow, and using this on top to finish it. I’m interested in trying a colored one now to have an easy one step look. Living Proof Perfect Hair Day Night Cap- I don’t do too many hair products. The sample said you could use it with wet hair or dry hair. I tried it with both. With dry hair I had good results, my hair seemed very shiny the next day. It didn’t work with wet hair for me. I feel like my hair didn’t look too great the next morning. It does have heavy scent. I liked the scent but if you are scent sensitive that is something to think about. Atelier Cologne Sud magnolia- The notes say this has a warm floral scent. I didn’t like it on my skin but my mom really liked it. All of these products sound so great! Subscription boxes are so fun! The overnight hair cap is particularly interesting.... cool beauty haul!